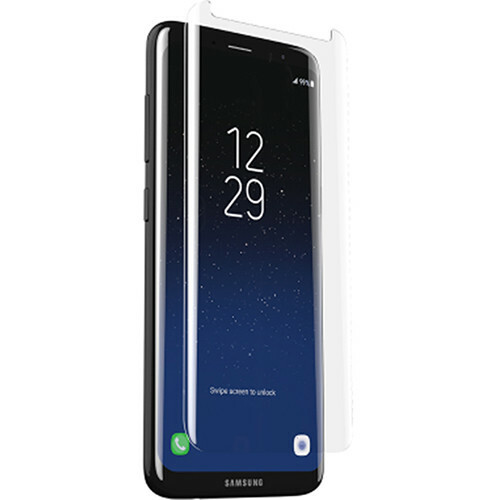 Protect your Galaxy S8's display with a Zagg InvisibleShield Glass Curve Screen Protector. This protector is curved to fit your device's screen and is made from tempered glass for impact and scratch protection. The Glass Curve features an oil-resistant coating to reduce smudges and fingerprints and fits most cases. Box Dimensions (LxWxH) 7.65 x 4.25 x 1.1"
InvisibleShield Glass Curve Screen Protector for Galaxy S8 is rated 3.0 out of 5 by 4. Rated 2 out of 5 by Glen from Does not stick well Screen protector popped off after a two foot fall. Rated 5 out of 5 by Robert from Great Phone Display Protector My second glass curve shield protector.? First one broke when my phone fell out of its holster on concrete floor.? No damage to phone display. Rated 2 out of 5 by bruno from protector i don't like. does this screen protector have adhesive on the entire glass or only around the edges? This protector have adhesive only around the edges. But it fits perfectly with a case for the back.